An aerial survey for bald eagles at Clarks Hill Lake last fall provided a disturbing glimpse into the toll of a mysterious neurological disease. Georgia DNR’s Nongame Conservation Section checks known bald eagle nest sites in the state each January to determine territory occupancy. The helicopter flights are repeated in March to document nest success and productivity. But in mid-November, through a grant from the American Eagle Foundation, the agency also surveyed sites where Avian Vacuolar Myelinopathy has been documented. 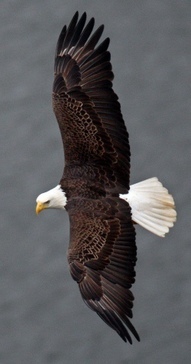 Avian Vacuolar Myelinopathy, or AVM, has led to the deaths of several dozen bald eagles, probably thousands of coots and at least a few individuals of other bird species over the past few years. While the cause of AVM remains a mystery, enough pieces have been connected to indicate a link to a newly-discovered cyanobacteria species that grows on submerged aquatic plants. Commonly called Stig, for the order Stigonematales, the cyanobacteria apparently produces a toxin that creates vacuoles, or holes, in nerve cells. The degeneration results in loss of motor skills and eventually death. Coots, which migrate to the southeastern U.S. in large numbers for the winter, ingest Stig and the toxin as they feed on aquatic vegetation. Eagles target vulnerable coots affected by the toxin, picking it up secondarily. Stig appears to especially proliferate on hydrilla, an invasive exotic weed that under certain conditions can produce dense mats. Wintering coots are attracted to the plentiful food supplied by hydrilla-infested lakes, and the eagles are not far behind. The effects of the toxicity appear to peak about mid-November, shortly after the coots arrive and just as eagles are beginning to nest. Although AVM is fairly limited in distribution, having been detected at only a few sites across the Southeast, its impacts are noticeable. Clarks Hill, or J. Strom Thurmond, on the Savannah River north of Augusta has hundreds of acres of hydrilla coverage, lots of Stig and a high level of bald eagle mortality. Clarks Hill was home to seven bald eagle nesting territories a few years ago. Yet, despite steady growth in the nesting eagle population statewide, only one nesting territory on Clarks Hill persists, and it is on the far northern portion of the lake where the Broad River enters. Past surveys at Clarks Hill in January and March have found very few eagles. But dead eagles have been seen on nests (pictured above). It appeared that some eagles tried to nest but didn’t survive until January. The AVM survey compared eagle counts from last fall with those from later in the nesting season. In November, good numbers of adult and immature eagles were observed at Clarks Hill and other sites, including a pair at a nest near Woodlawn that had last been documented as active several years ago. However, in January only one living eagle was observed south of the Broad River – a juvenile whose wobbly flight suggested AVM. 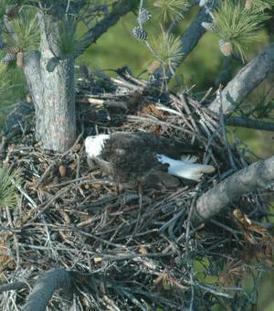 The Woodlawn nest contained the carcass of an adult eagle. Although it’s not certain that AVM caused the rapid drop in eagle numbers at Clarks Hill, that scenario is strongly suggested. It appears that dozens of eagles of all ages move to the lake in the fall, probably attracted by thousands of coots that just arrived seeking the abundant hydrilla. A few adult eagle pairs re-establish nesting territories. But over the next few weeks, almost all die or disappear. In partnership with researchers at the University of Georgia, the Nongame Conservation Section hopes to attach radio transmitters to several eagles early next fall to determine their fate. But if the mystery of AVM is solved, what then? As of now, it appears the best management strategy is to reduce or eliminate hydrilla. Yet that is far from a simple solution. Grass carp and herbicides are effective but expensive, even on a small scale. At Clarks Hill, an Army Corps of Engineers reservoir, the issue is complicated by the lake’s size – 70,000 acres – and diversity of users. Aquatic vegetation in moderation generally provides good wildlife habitat and can improve fishing and waterfowl hunting opportunities. On the other hand, the hydrilla mats severely interfere with boating, skiing, swimming and other recreation. Through consulting with Georgia and South Carolina wildlife agencies, and with the public’s input, the Corps of Engineers plans to develop a best-approach strategy to responsibly manage the natural resources for all. Jim Ozier, a Nongame Conservation Section program manager, conducts DNR’s eagle surveys. It has been another successful season for that band of travelling prescribed-fire specialists known as DNR's seasonal fire crew. 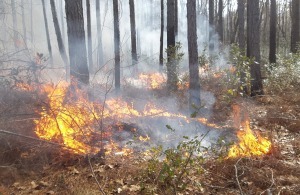 In four months, we burned 9,882 acres across the state – in state parks and natural and wildlife management areas, on private property, and on several sections of the Oconee National Forest. A major theme for this season was interagency cooperation, as we performed some of our largest and most complicated burns with help from The Nature Conservancy, The Orianne Society, the Georgia Forestry Commission, state park staff and a network of hardy volunteers. This time around, local volunteer fire departments also joined the cast of characters, bringing their fire-suppression expertise and high-volume tanker engines to the fire line. Read the rest of Hilary's review on the Wildlife Resources Division blog! Hilary Smith is a third-year member of the seasonal prescribed fire crew hired by DNR’s Nongame Conservation Section. (Also see “Burn Season’s Late Rush Fuels Teamwork, Learning,”) Prescribed fire is the most effective tool for conserving and restoring fire-adapted habitats that support numerous species of conservation concern. The seasonal crew recently helped burn 150 acres at the Lewis Tract in Brantley County, site of one of the largest known populations of federally endangered hairy rattleweed (“World’s best site for imperiled plant protected,” January 2010). This Nature Conservancy video profiles the University of Montana practicum on prescribed fire in Georgia. The Atlanta falcons have hatched. Watch the chicks grow – yes, meals with these two toddlers are messy! – and join Nongame Program Manager Jim Ozier at noon April 30 for an online raptor chat on our Ustream channel. 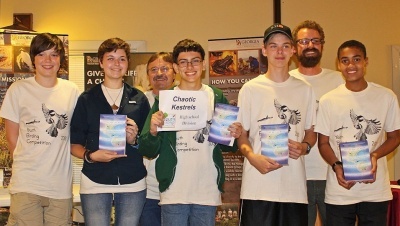 The Chaotic Kestrels, left, were rather methodical in their quest to win the 2013 Youth Birding Competition, scouring sites from the coast to the Piedmont to log 136 bird species. Meanwhile, participation in the birdathon (photos) nudged the eight-year event total to 489 youths, 54 of whom competed at least four years. Although Carolina chickadees are common, the stipple version of a chickadee by Clarkesville 11th-grader Anna Hamilton, below, is anything but. 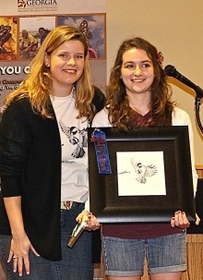 See the Youth Birding Competition T-shirt Art grand prize winner and other division winners. More young talent will be on display starting Friday as the Go Fish Education Center showcases statewide winners in the Give Wildlife a Chance Poster Contest. Top art (photos) from The State Botanical Garden of Georgia and DNR competition will be featured at the center in Perry through May 12. What does gopher frog success sound like? Listen to these gopher frog mating calls at Williams Bluffs Preserve, evidence along with the recent discovery of egg masses that efforts to introduce the rare frogs at the Early County site are working ("Eggs mark leap forward,” Feb. 28). Tip: The gopher frog call on the track is the low, snoring sound. The higher-pitched calls are ornate chorus frogs and, less frequently, spring peepers. An average calving season this winter for North Atlantic right whales is OK with DNR marine mammals biologist Clay George. The 20 cow/calf pairs were “just what we needed after such a poor showing last season,” said George, referring to the seven calves reported in 2011-2012. Spring migration is in full swing, with species as varied as Cape May warblers and upland sandpipers winging through Georgia for nesting grounds farther north. Keep track via Ebird and Georgia Birders Online, or GABO. A whimbrel tagged last spring at a St. Simons Island marsh is back, after a round-trip that included breeding grounds in the Arctic and winter in Brazil, writes Nongame Conservation Section biologist Tim Keyes. Look for details in the next issue of Georgia Wild. Sign-up now for junior naturalist summer camps at DNR’s Charlie Elliott Wildlife Center. Camps vary from day sessions that introduce younger children to the animal world around them to overnighters that involve teens in activities such as mist-netting bats and learning how to care for wildlife. Ohoopee Dunes will be a focal point for tours and DNR information booths at Swainsboro’s ongoing Pine Tree Festival & Southeast Timber Expo – parade day is May 4 – and the Hoopee Jam, a May 3-4 music festival in nearby Norristown. Nongame coastal staff coordinated and joined a two-day water hyacinth removal project on the Altamaha River, using AmeriCorps volunteers and collaborating with the Wildlife Resources Division’s Game Management Section, DNR’s Coastal Resources Division and The Nature Conservancy. Read about efforts to connect children in Savannah-area Title I schools with the coastal outdoors, plus why wrack is important and how oyster shells are being used to build oyster reefs. It’s all in the spring issue of Coastal Resources Division’s The Georgia Sound. Hog drones? Two Louisiana engineers and airplane hobbyists have outfitted a remote-control plane with a thermal imaging camera to spot feral hogs at night. The live video feed directs one of the men with a rifle and night scope to hard-to-find hogs, bane of everything from food crops to rare plants. 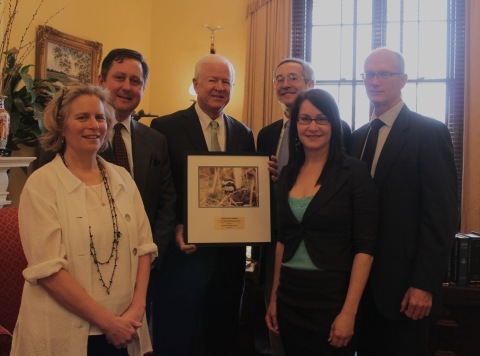 presented the award March 6 during Teaming With Wildlife’s annual “fly-in” in Washington. and Rosa L. DeLauro, D-Connecticut. ** DNR's seasonal fire crew takes a break for a group shot. ** Prescribed fire at work.